"At about 1:00 P.M., October 23, 1864 Confederate General Shelby was withdrawing slowly from his position near the Wornall House. He had been ordered to pull back by General Price because of the collapse of Marmaduke's Confederate line at Byram's Ford. Union troops under General Pleasonton arrived here at that time. In the lead was Thurber's Battery of Rodman Guns. They opened fire from the edge of the grove that was here. Philips' Union Brigade arrive. Shelby retreated south and east with Union Generals Blunt and Philips in hot pursuit." Directions to Stop #11: Tour Stop 11 is located at the intersection of 63rd Street and Walnut Street. Leave tour stop 10 and drive east on 61st Terrace for about a block. Turn right (south) on Brookside Boulevard. Drive about 0.2 miles and tun left (east) on 63rd Street. Walnut Street is about four blocks east. Turn right onto Walnut and find a place to park. 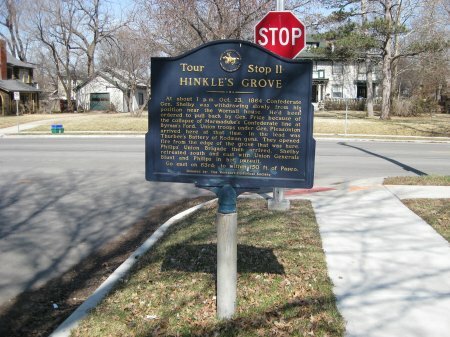 The marker is on the southeast corner of the intersection. This tour stop is located in Kansas City, Missouri 64113. Description: Unfortunately, there is not a lot to see here, but try to use your imagination as I describe certain critical events that took place on October 23, 1864 on this spot. Remember that while the Union Army of the Border had attacked the Confederate Army of Missouri from Brush Creek at dawn on Sunday morning, Union Major General Alfred Pleasonton's Cavalry Division had planned to attack the Confederates at Byram's Ford on the Big Blue River (The Battle of Byram's Ford). Byram's Ford (Tour Stop 17) is located about 3.5 miles east of where you are standing. For a variety of reasons, Pleasonton's Division did not attack at Byram's Ford until midmorning on Sunday, October 23, 1864. The Federals forced a crossing of the river and made several charges against the strong defensive position held by Confederate Major General John S. Marmaduke's Division on the west side of the Big Blue River. Around noon the attacking Federals overwhelmed Marmaduke's forces which withdrew to the west. The Federal cavalrymen kept up their pressure on the retreating Confederates. Marmaduke's troops kept up steady resistance, but were pushed back out of the timber and onto the prairie by the Federal advance. Once out in the open, Marmaduke's Division was exposed to fire from Battery H of the Second Missouri Light Artillery. As this point, Pleasonton arrived on the scene and strongly encouraged his troops to keep up the pressure. The Confederate defenders turned and quickly withdrew to the west. Pleasonton rode up and quickly regrouped his men to continue the pursuit. He advanced Battery H up to Hinkle's Grove near where you are standing. Now the battery was in position to hit Shelby's right flank. They fired on the Confederate Iron Brigade just as Curtis launched his general charge by the Army of the Border. The Union forces were on both sides with the Confederates stuck in the middle.